When you listen to a lot of different avant-garde jazz releases, you have to mentally prepare yourself. You don't listen to Cecil Taylor or Albert Ayler as background music. You don't put "Interstellar Space" on and just go ahead and do the dishes. Free jazz, spiritual jazz, vanguard jazz, this is is music literally created to combat the passive and often dismissive nature of people wanting to "listen" to jazz. With a notion of jazz being for the beatniks and the coffee shops, the idea was struck down quickly by these very masters - finding new ground in the same way that many psychedelic rock bands were allowing hippies to reach higher astral planes. 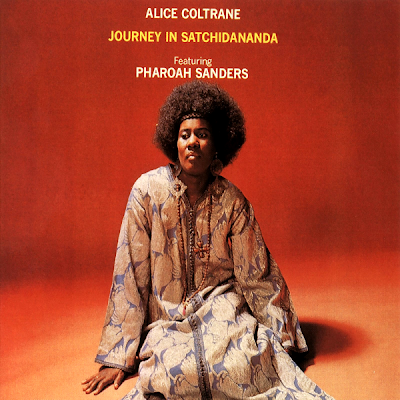 Alice Coltrane fits in with these masters perfectly. She created difficult music with her husband before his untimely death, and made a career of perpetuating different experiments that crossed various genre lines. However, with "Journey In Satchidanda", you don't have to mentally prepare yourself for the listening experience. It's not grating, it's beautiful. And regardless of where you are, it will pull you in. It works as both background music and as one of the most engaging listens in your library. It's a crossover record in the most personal way. And it gets better every time. Of all the spiritual jazz pioneers, perhaps none were quite as spiritual as Alice. Oh and she plays the harp. Alice also employs the piano in her repetoire, and on this album is joined by two of my favorite musicians: Pharoah Sanders on soprano sax and Charlie Haden on bass. These three create a dynamic nucleus that is engulfed by the constant drone provided by middle-eastern instruments the oud and tamboura. There have been many attempts at bridging traditional middle-eastern or indian instruments with western jazz music and I will say right here: "Journey In Satchidanda" is likely the best. This is the rare album that expands the loose definition of jazz yet remains an accessible album. For those who like traditional jazz numbers or the lighter side, they are unlikely to feel too alienated with this release. For those who only like jazz that transports them places, that takes a while to understand - they will feel right at home here too. The beauty this record can stop you in your tracks. It can cause obsession. It truly is a "journey".